Abstract: In this review some typical formations are listed according to tectonic units and in a stratigraphic order. Results achieved in the last years are specially emphasized. In the Mecsek Mts Middle Triassic marly dolomites contain corrensite. There is only illite and some illite/smectite depending on diagenetic grade in the Liassic limestones. In the Toarcian manganese ores at Urkut (Trandanubian Range) typical chemical sedimentation and diagenesis produced an assemblage of celadonite and nontronite. In the Lower Cretaceous sandstones and marls of Gerecse Mts a corrensite-rich association could be derived from ophiolitic sources. In thick clastic detrital sequences of Paleogene and Neogene basins mixed-layer illite/smectites display diagenetic transition toward illite depending on depth, temperature, rate of subsidence and subsequent tectonism. In Pliocene and Quaternary basaltic craters of W Transdanubia bentonites consist of iron-rich beidellites. Red clays contain disordered kaolinite-bearing and a smectite(+vermiculite)-bearing units. At Visonta high charge beidellites were found. Paleontological and mineralogical records agree well in the fresh and paleosol layers of loess. In the clay fraction of Recent soils, chernozems are characterized by illite, brown forest soils, humic gleys and salt affected soils by more smectite-rich associations. Abstract: Ferric oxide admixtures in the concentration range 0.1–10 % in soils, sediments, and clay mineral samples can be conveniently characterized by Vis diffuse reflectance spectroscopy (DRS) in the region of d-d electron transitions close to 500 nm, voltammetry of microparticles, and voltammetry with carbon paste electroactive electrode (CPEE). DRS also detects Fe(III) in the clay mineral matrix equally sensitively. Voltammetry of microparticles is suitable for direct detection of free crystalline and amorphous ferric oxides. The determination limit of total free ferric oxides with CPEE is ~0.01 %. The techniques were tested with six clay mineral samples. XRD was able to detect free FeOOH in only one of them (1.6 %), DRS and CPEE also detected 0.19 % FeOOH in Be-3 (bentonite of Rokle deposit, Bohemia) and 0.04 % in reference montmorillonite Swy-2. Abstract: Geochemical processes that result in the reduction of hexavalent chromium in natural waters with pyrite (FeS2) have been studied at varying degrees of pH (from 1.2 to 12.6) and solution concentration (from 0.001 to 0.3 M of Cr(VI)) in order to demonstrate the differences in the proportions of elements between the aqueous and solid phases and to infer mechanisms that limit the Cr(VI) concentration in pore-waters in iron sulphide-rich environments. The experiments were carried out in the absence of oxygen and on pyrite grains previously treated to remove any oxide or sulphur layer at the mineral surface. The methods used to characterize reacting solutions and mineral surface comprised: chemical analyses (microprobe analyses and inductively coupled plasma analyses), scanning electron microscopy, atomic force microscopy and X-ray single crystal analysis. The results suggest that: 1) mineral dissolution increases with decreasing pH, whereas it is close to zero at pH > 7; at alkaline pH, the Cr(VI) reduction is very low and the decrease in total Cr probably indicates the formation of precipitated phases, like FeCrO4, on the pyrite surface; 2) Cr(VI) reduction is significant at pH < 2.3. Cr(VI) to Cr(III) reduction involves the oxidation of Fe(II) and S22– on the pyrite surfaces, following the reaction 2FeS2+5Cr2O72–+32H+ → 2Fe(OH)3+4(SO4)2–+10Cr3++13H2O; 3) at acidic pH all the pyrite crystals show a variable Cr content on the surfaces. Abstract: Four series of reduced-charge montmorillonites, with ranges in layer charge, were prepared from parent Ca-montmorillonites of various chemical compositions. Fine fractions of bentonites from Otay (USA), Ivancice (Czech Republic), Sarigus (Armenia) and Kriva Palanka (Macedonia) were used. The extent of ion exchange, 62–89 % of CEC covered by Li+, was dependent on the mineral and on the Li+, concentration in the liquid phase. Different levels of charge reduction were achieved via Li-fixation by heating the samples for 24 h at 110–300 °C. Li+, ions were fixed in the layers of all four montmorillonites, but incomplete Li+, for Ca2+ exchange diminished the extent of charge reduction. Heating the samples at temperatures up to 140 °C caused Li-fixation and reduction in relative cation-exchange capacity (CEC) values by 32 to 48 % but only a decrease by 17 to 24 % in the sorption of water and by 4 to 14 % of ethylene glycol monoethyl ether. The greatest changes in these properties were observed among the samples prepared at 130–200 °C, while higher temperatures had little effect. The most extensive reduction in CEC, by 81 % after preparation at 300 °C, was obtained for the Otay montmorillonite, the mineral with the highest octahedral and the lowest tetrahedral charge and the greatest level of Li+, for Ca2+ exchange. Higher tetrahedral charge and a lower level of Li+, for Ca2+ exchange negatively affected the decrease in the cation exchange capacities, the specific surface areas and the water uptake capabilities of the prepared reduced-charge montmorillonites. Abstract: The microporosity of Al-pillared Li-montmorillonites with different layer charges obtained by thermal treatment at different temperatures was studied by nitrogen adsorption/desorption at -196 °C. A correlation was observed between the decreasing sorption capacity of samples derived from lithiated precursors heated at ever increasing temperature and the increasing contribution of the collapsed pyrophyllite-like areas inactive in pillaring. The dominant micropore radius remained below 3.5×10–1 nm for all pillared samples, showing that, contrary to the common belief, the layer charge reduction by Hofmann-Klemen effect fails to bring about substantial changes in the lateral interpillar distances. Abstract: The oil drilling holes carried out on the Saharan Platform (southern Tunisia) produced evidence of the presence of Paleozoic bedrock. The dominant lithology of the Lower Paleozoic is clays and sandstones whereas the Upper Paleozoic is marked by carbonated sandstone and clayey marine series. The qualitative and semiquantitative mineralogical compositions (bulk rock and clay fraction) were evaluated by X-ray diffraction, using Siemens Kristalloflex 810 diffractometer. The chemical analyses of major elements were carried out by Atomic Absorption Spectrophotometry. Trace and rare earth elements were determined by ICP-MS Perkin-Elmer SCIEX Elan-5000. Chemical microcomposition was determined using Phillips CM20 STEM. The mineralogical studies of Paleozoic clays showed the predominance of illite accompanied by small amounts of kaolinite and chlorite. The geochemical data put in evidence the relatively high amounts of Fe2O3 and Na2O which are most probably associated with aluminosilicates. The flat pace of the rare earth curve analyzed in relation to the NASC indicates the tendency to the impoverishment in HREE. Abstract: In this region, marine, continental and lacustrine clay deposits which are used as a raw material in the cement sector were investigated. It is seen that Upper Cretaceous-Upper Eocene shales representing marine deposition are found in Malidagi in economic quantities. However, their Na2O % and K2O % contents are higher than in other clays. The Oligocene aged Bayiralan clay representing marine deposition have abundant magnesian minerals. Because of its high MgO % content, this clay is not suitable cement standard. The areal extent of the Upper Miocene-Lower Pliocene Kizilburun clays represented fine sediments in the floodplain are widely situated. These may be used in cement sector, but they have reserve and environmental problems. 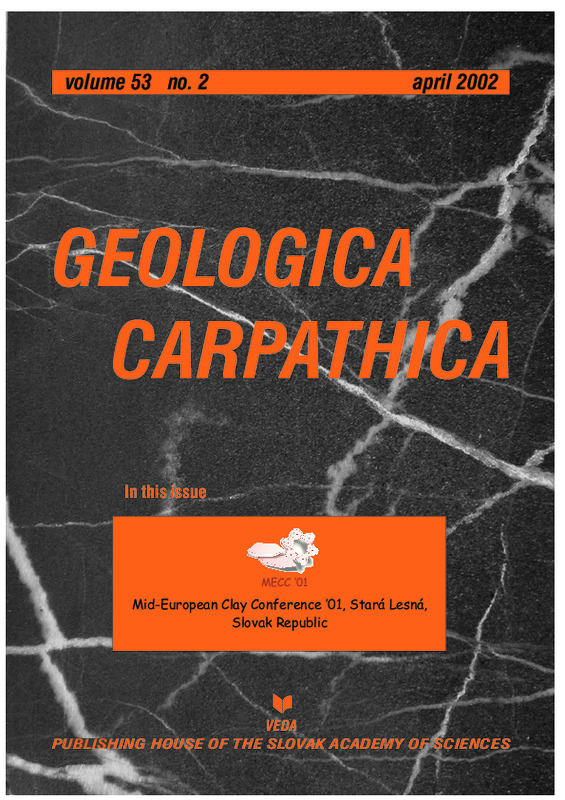 The red coloured clays belonging to the Pliocene Sakizcilar Formation are suitable for cement standard. To decreasing the transportation costs of the Denizli cement factory, the Malidagi clay and Sakizcilar clay may be used together in different proportions. If the Malidagi and Sakizcilar clays may be used, the contents of K2O % and Na2O % will decrease. Abstract: Dissolution rates of several clay materials (reference kaolinite samples, natural kaolinites of different origin, illitic clays, halloysite) in 0.5 and 5 M sulphuric and 1 M hydrochloric acids were determined by measuring the release rate of aluminium into solution. The X-ray powder diffraction and X-ray fluorescence methods have been employed for mineralogical and chemical analyses of clay samples, respectively. The surface area of the samples was determined by a N2 adsorption technique (BET). The dissolved Al concentration was determined by spectrophotometry. The dissolution rate of kaolinite in 0.5 M sulphuric acid at 25 °C is approximately three times higher than in hydrochloric acid of formally equivalent H+ concentration. The dissolution in 5 M sulphuric acid is eight times faster if the solid phase is periodically separated from the acid solution, washed by distilled water and dried. The aluminium release rate decreases with the increasing amounts of clay micas in kaolinitic clays and is affected by the concentration of Al in the mineral structure. Crystallinity, as a factor reflecting the quality of the crystal structure, influences significantly the aluminium release rates during dissolution by acids. Abstract: Six different pieces of gothic wooden panels or sculptures and baroque canvas paintings were chosen to identify the content, mineralogy and crystallinity of clay minerals present in pigments of original grounds and painting layers. Electron microscopy and microanalysis, X-ray diffraction and electron diffraction have been used to investigate minute heterogeneous material fragments. Reference commercial clay-rich pigments have also been measured. The greyish basal layer of some chalk grounds of gothic paintings and sculptures is more siliceous than expected with only a low content of clays. Baroque bole grounds are rich in clays, they contain predominantly kaolinite, mostly well-ordered; illite is common, smectite was enriched especially in the ground of a Baroque painting by Ch.A. Coypel. Abstract: Geocomposite clay liners (GCLs) are used in environmental, transportation and geotechnical engineering applications. Determination of the internal and interface shear strength parameters of GCLs has a huge importance for stability analyses. Therefore, the study of the internal shear strength of one type of nonreinforced GCLs was performed. Laboratory testing programme consisted of five series of direct shear tests. Special attention was given to the influence of the specimen hydration procedure and horizontal displacement rate on the shear test results. The analysis of the direct shear tests, presented in the paper, clearly demonstrate that the measured values of internal shear strength depend on the way of performing the laboratory tests. The internal shear strength envelopes for nonreinforced GCLs are proposed on the basis of obtained results. Abstract: The publication production of clay minerals is analysed on the basis of the works registered in the SCI database in 1980–2001. A continuous increase of the annual number of works in this period is registered while the proportion of the number of works devoted to individual clay minerals remains almost unchanged throughout the whole period. The subject of publication production is substantially dependent on the type of mineral followed; material research oriented papers, catalysis and organo/clay interactions research prevail among the papers with a chemical character. The average citation response to the set of analysed papers is about 10–15 citations/paper and uncited papers represent 9–35 % of the total number of papers. The most cited papers (in individual years) are cited on average 109-times annually and half-time of the citations count per paper exceeds 20 years. The average time between appearing and the greatest citation response can be estimated at 5 years.